Anyone who knows me, will know I am a Woolworths ‘baby’. My clothes, my food, my cutlery all come from Woolworths. Since I first earned my own money, and had my own house, I have bought all my food from Woolworths. My father just nods, and Dave’s eyes roll back when ever my answer to the question “where did you get this from” is “Woolies”. I shop there at least twice a week and I enjoy my VIP status. Of course, the staff know me and that helps when I am looking for something special. When Woolworths launched their own in house magazine – Taste, I subscribed. I have every single one and mostly I read the columns, and glance at the recipes. 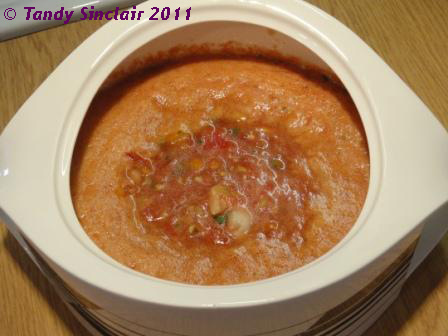 March 2011 sees the 59th edition and I decided to give the gezpacho recipe (page 26) a go. I read it once, while writing my shopping list and then only followed the recipe bit when making the gezpacho. I had to read the recipe twice more, because at the end of it I had left over cherry tomatoes and coriander and I was confused. I have adapted the recipe to suit my tastes, and as I knew if there were leftovers I could make a pasta sauce out of them. For the original recipe please see the magazine. it is really good for hot weather!